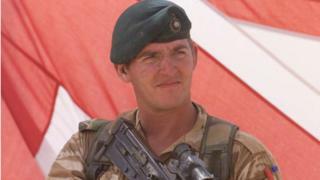 The Royal Marine jailed for killing a wounded Taliban fighter is to be freed on Friday, campaigners have said. Sgt Alexander Blackman, also known as Marine A, got a life sentence in 2013 for murder, but his conviction was later reduced to manslaughter. The 42-year-old from Taunton, Somerset, has served three years of a seven-year sentence. Campaign group Justice for Marine A, which revealed the news, said it was "delighted". The commando, who was convicted of manslaughter on the basis of diminished responsibility, will leave Erlestoke Prison, near Devizes, Wiltshire. His original murder conviction was quashed by the Court Martial Appeal Court in March, after the hearing was told he had a recognised mental illness at the time of the shooting in September 2011. Justice for Marine A said the time and date of Sgt Blackman's release would not be made public due to "privacy and safety concerns". It called on supporters to "remember that this is a tense time for the family". A spokeswoman for the Ministry of Justice refused to comment on the time of Blackman's release.